Quince have a coarse texture, are too hard, astringent and sour to eat raw but when cooked it softens and changes colour from creamy white to pink-dark orange and near to red whilst it releases all its sweet aroma and delicate flavour. The combination of quince with the sweet taste of prunes and the natural sweet taste of pork and the fortified Cyprio wine, called Commandaria, makes it a gourmet meal and I highly recommend it. Quince is known from ancient years and its cultivation is said to have preceded that ofthe apple culture.Many references to “apples”, in the ancient years may have been to a quince. Among the ancient Greeks, the quince was a ritual offering at weddings, for it had come from the Levant with Aphrodite and remained sacred to her. Plutarch reports that a Greek bride would nibble a quince to perfume her kiss before entering the bridal chamber, “in order that the first greeting may not be disagreeable nor unpleasant”. In Greek mythology it was a quince that Paris awarded Aphrodite and we also know that Heracles on his penultimate task was asked to pluck three golden apples from the tree of the Hesperides, (nymphs of the evening). This yellow fruit was known to the Akkadians, who called it supurgillu ; Arabic سفرجل safarjal = “quinces” (collective plural). The modern name originated in the 14th century as a plural of quoyn, via Old French cooin from Latin cotoneum malum / cydonium malum, ultimately from Greek κυδώνιον μήλον, kydonion melon “Kydonian apple” (in the figurative sense, similar to pomodoro – Italian word for tomato literally meaning “apple of gold”, pomme de terre – the French word for potato, literally meaning “apple of the ground”, and the classical “golden apple”). I wanted to make my twist to this traditional Greek dish and I let my instinct guide me with the addition of ginger, Commandaria, chestnuts and a variety of peppers. I have never seen ginger added to this recipe but my instinct was right as it added an additional flavour and warmth to the dish. Regarding the choice of wine, this is also very original as most recipes call for red dry wine and some for white wine. Commandaria is a unique lovely Cypriot sweet dessert wine with a lovely aroma and added its unique flavour to this dish. I have experimented with Commandaria before, although I do not remember if I have posted the recipes yet. As much as I would like to use it more often it is quite expensive to be used in every day recipes but for special dishes like this one, it is worth while. Chestnuts was also a lovely addition, adding crunchiness and sweet taste. Begin by boiling and peeling the chestnuts. See how to do it here. Peel quinces, cut them in slices and put them in a bowl with water and a few tablespoons of lemon juice. Wash and cut meat into pieces and drain. Season with salt and pepper and dredge into flour. Heat the olive oil in a sautéing pan and sauté the quinces on both sides. Remove to a platter and set aside. Sauté the onion and garlic until translucent and then add the meat and sauté on both side. Add the wine and allow the alcohol to evaporate.Add honey and all spices and finally add the ginger and the water. Add the quinces, chestnuts and prunes. When it starts boiling, reduce heat and simmer covered, until the quinces are soft and the sauce is thick. If you cannot find quinces you may substitute it with apples or pears preferably not ripe and with a sour taste. I am submitting this recipe to Anne’s Cool Finds, who is hosting this year’s Event A Taste of Terroir 2009. Ooohhh, that’s one of my favorite Greek dishes! With added chestnuts, it must be fantastic! I have never made anything with quince. It was a very informative read ivy. I should look here in the shop if i get them here. From your pic it looks a bit like pears. Rosa, I am glad you are familiar to this dish. It is delicious, isn’t it? Happy Cook, Syama is the same age as my daughter but she would kill me if I posted a picture of hers. She also has very long hair like your daughter. It does look like a pear and pear tree and apples trees can be grafted in to quince and vice versa. Mmmm…great idea to put in the ginger. My parents always had a bottle of “Commandaria” in the house! Seeing it brought back so many memories! Wonderful combination of flavors! Bravo Ivy! What a great combination of flavors! 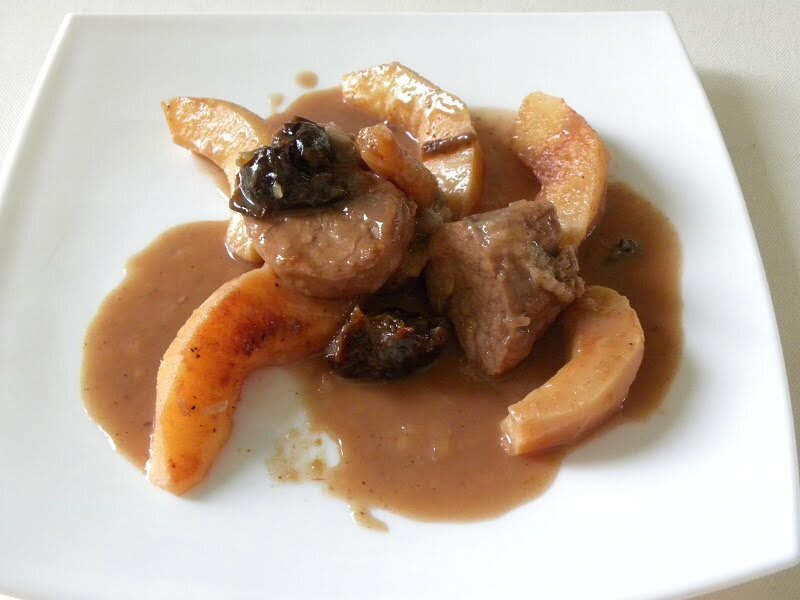 I love pork with prunes but add quince, chestnuts, and all those wonderful spices…wow! Must have been delicious. Thanks a lot for the info on quinces and the tales in ancient Greek mythology. I always enjoy reading about ancient Greece and the origin of food. The recipe is very good as well. I will have to look for quinces around here. You really like quinces Ivy! I never bought one… in fact I don’t think I have tasted one like you did… it sounds so interesting though. Great dish Ivy! Pork and quince is a classic Greek combination. Though on the historical notes I have to say that the confusion between quinces and apples is not a clear one and remains a scholarly hypothesis that will likely never be proven true or untrue. Both apples and quince were common in ancient Greek gastronomy. This looks and sounds delicious Ivy. I have never heard of Commandaria before, but I am keen to look out for it now. It’s a pity the groom didn’t also think of chewing on a quince! Ivy, we’re sharing the same food cravings…I had pork with quinces just last night! This Cypriot fortified wine…would you say it’s similar to a Port or Mavrodaphne? Ivy, thank you so much for the history lesson. I love reading this type of material. Quince, in Spanish, is membrillo. It is used in a variety of dishes in Mexico. There is a jelly that is made with it that is out of this world. Thank you for the wonderful recipe. Looks great! I love fresh ginger so much and I’m sure it goes great here. I LOVE chestnuts, too. I will be posting a chestnut soup soon. Peter G, Mariana, Joan, Ben, Val, Nuria and Elly, thank you all for your comments. Sam, I believe you as I have already said in the past that I don’t trust the information found in Wikipedia, but that was the only information available. Peter, I’ve never tried mavrodaphne before except in the Holy Communion neither port but Commandaria is also used in Cyprus for the Holy Communion, so they may be similar, although Commandaria is of a higher quality, as is said. Teresa, I know that quince is high in pectine. If you have this recipe I would like to try it. Wonderful post and perfect for A Taste of Terroir. Thanks for participating. My mother was a fan of quince too! Your recipes are mind blowing. This looks amazing.